Fig trees (Ficus carica) can be challenging to grow as houseplants year-round, since they usually lose their leaves and drop into dormancy in autumn. Most cultivars -- whose hardiness varies from U.S. Department of Agriculture plant hardiness zones 4 through 10, depending on how much protection they are given -- also grow too large for indoor conditions. In The Unexpected Houseplant, Tovah Martin writes that "The exception to this rule is 'Petite Negra.'" That dwarf fig can keep its leaves over winter indoors and produce fruit there, while maintaining a petite size. Fig flowers develop inside the fruits. Ficus carica "Petite Negra," perennial in USDA zones 8 through 10, may begin fruiting when it stands only 1 foot tall. Also known as "Black Jack" or "Petite Negri," it can grow to 8 or 10 feet, but probably won't surpass 3 feet when raised as a houseplant. Although the self-pollinating plant is small, it produces medium to large dark purple fruits with red flesh, usually in early summer and early autumn. To keep your fig growing all year, place it in a location -- preferably in front of a south-facing window -- where it receives at least 8 hours of direct sunlight per day and no temperatures below 50 degrees Fahrenheit. A mature tree will require a pot 18 inches in diameter with drainage holes, preferably filled with a somewhat gritty mix, such as 2 parts of organic potting soil and 1 part of fine gravel. If your plant isn't full-grown yet, start it off in a smaller pot and work your way up, as it fruits best when slightly root bound. During its growing season, from spring through fall, water the fig whenever the surface of its soil feels dry to the touch. Feed it once every two weeks during that time period with a balanced plant food such as 20-20-20, combining 1/2 teaspoon of the crystals with 1 gallon of water. 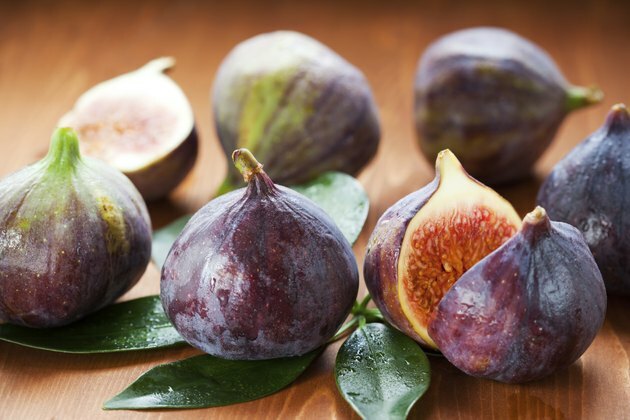 Don't feed the fig during the winter months and reduce watering somewhat during that time, but never allow the soil to completely dry out. If your fig tree grows lanky over winter, you can cut it back in early spring before it starts putting out new growth. However, keep in mind that such lopping might remove some of the tiny pea-sized fruits that may or may not have formed in the leaf axils the previous autumn. If you wish to proceed anyway, clean your pruning shears with rubbing alcohol and cut the tree to the shape that you prefer. For figs, thin rather than trim an overlong shoot, by pruning it back to within 2 inches of its base rather than just shortening it. Although some of the smaller early summer crop -- which is produced on old wood -- may be lost, additional fruits will form on the new growth stimulated by the pruning. Those fruits should ripen in early autumn. When grown indoors, a fig tree may suffer from spider mites, tiny spider-like insects difficult to see without a magnifying glass, which mottle the foliage and sometimes -- in severe cases -- spin webs beneath it. Scale insects can make waxy brown bumps on the plant's stems and the undersides of its leaves, accompanied by a sticky moisture often called "honeydew." To eliminate either pest, mix 2 tablespoons of pure neem oil and 1 1/2 teaspoons of mild dish detergent with 1 gallon of water. After donning goggles and a respirator, spray the plant thoroughly. Repeat the oil treatment one week later for spider mites, once every two weeks for two months for scale.